TOKYO -– Suzuki Motor Corp. said Thursday it has started arbitration proceedings against Volkswagen AG in an attempt to force the German carmaker to relinquish its 19.9 percent stake in Suzuki. VW responded by saying there's "no legal basis" to force the German carmaker to sell back its stake, according to an e-mailed statement. Europe's biggest auto manufacturer "categorically rejects" allegations by Suzuki and is "confident" to prevail in an arbitration procedure, spokesman Eric Felber said in the statement. The arbitration will take place at an international court in London, Hamamatsu-based Suzuki said Thursday in a statement to the Tokyo Stock Exchange. Suzuki wants its estranged German partner to sell its stake back to Suzuki or a third party designated by Suzuki. 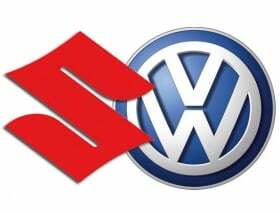 "The arbitration proceedings follow Suzuki's termination of its alliance with Volkswagen AG on 18 November 2011, and Volkswagen AG's lack of response to Suzuki's requests for the disposition of its shares," Suzuki said in a release. Volkswagen stepped in as Suzuki's biggest shareholder in 2009. It took the 19.9 percent stake in Suzuki, while Suzuki took a 1.5 percent holding in VW. The partnership was billed as a way for VW to get access to the India market, where Suzuki is strong, and for Suzuki to get advanced technologies from VW that it doesn't have the budget to develop on its own. But the alliance began unraveling earlier this year, when VW described Suzuki as an "associate" it has sizable management control over. That upset Suzuki's leaders. Since then, VW has accused Suzuki of breaching their agreement by sourcing diesel engines from Fiat. And Suzuki fired back that VW broke it by not sharing advanced drivetrain technologies that Suzuki had its eyes on. Their two-year tie up never yielded a joint project. On Sept. 12, Suzuki demanded that VW return its 19.9 percent stake in Suzuki. And on Nov. 18, Suzuki announced unilaterally that it was ending the partnership. "Volkswagen AG did not allow Suzuki access to Volkswagen AG's core technology and it also became clear that there were differences between Suzuki and Volkswagen in the understanding of 'independence,'" Suzuki said at the time. "The cross-shareholding alliance must be dissolved immediately and in so doing the parties will return to their independent status." Volkswagen has rejected Suzuki's efforts to end the partnership, calling them actions "without foundation," and has said it plans to retain the holding. Suzuki is prepared for the arbitration process to take up to two years to complete, Executive Vice President Yasuhito Harayama said Nov. 18. "While an arbitration will be legally binding," he said, "we think our relationship with Volkswagen may resolve in a friendly manner."